Are you in the market for a good steel barn to add to your property? Having a steel barn can make all the difference. Not only will you love the fact that you can store equipment and other costly belongings in your barn, your animals will also love the opportunity to get in out of the cold and enjoy some time out of the harsh elements. What if rather than a good steel barn, you could have the best of steel barns for sale? With Coast to Coast Carports, Inc., you can get started on your way to having a great barn for your most precious assets. 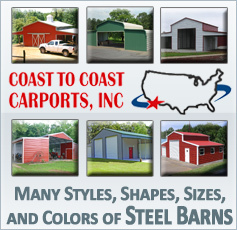 At Coast to Coast Carports, Inc., we specialize in offering customizable barn options, in addition to creating multiple other options for those in need of great structures. Not only do we go above and beyond your standard good steel barn to create the nicest steel barns made, we also manufacture other types of steel buildings, such as carports and other equipment storage buildings. You will be amazed at how easy it is to get your steel building, just the way you want it. With so many customizable options to choose from, you can get the right building for you and your uses. Did you know that Coast to Coast Carports, Inc. allows you to choose the color you want for your steel structure? Make the building you intend to add to your property fit right in and look great with the right color options and style. Choose from various door and window options, steel gauge types, roof lines and more. 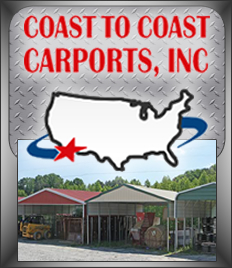 At Coast to Coast Carports, Inc. we are only happy when you get just the building you always wanted. Seem too good to be true? Contact us today to learn more about getting your building quickly and easily.